Our manual or automatic electric roller shutter garage doors and sectional garage doors not only provide secure protection but save space inside the garage and more space when fully open. You can park inches from the door yet still allow it to be opened safely. Our electric roller garage doors are CE marked for safety and backed by a comprehensive 7 year guarantee and highly competitive prices. 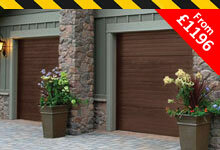 You can view our great garage doors prices here online, just select your door type from above. Either as DIY garage doors you can fit yourself or have them fitted by our professional door installation teams, we supply industry leading Seceuroglide products at great garage doors prices. All our roller garage doors are made to fit to your measurements with slats that are insulated against the weather as standard. Our automatic electric roller garage doors come with two remote controls using rolling code technology, and an internal manual override in the case of a power failure as standard. All door slats are constructed from high grade corrosion resistant aluminium with a CFC free foam core for thermal insulation and noise reduction. 75mm Guide Rails are supplied as standard for all doors up to 4600mm. 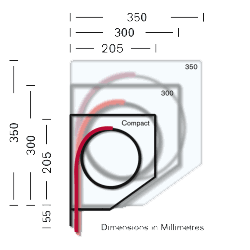 Doors over 4600mm wide come with 90mm guides. 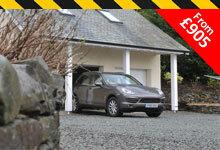 Our Excel roller garage doors is for higher security requirements. The Excel is the first roller garage door to be tested to LPS 1175 burglary resistance standard and gain Police Secured By Design and Insurance approval. 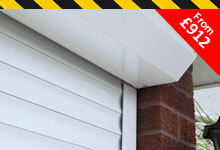 Leading garage roller shutter and electric security shutters companies based near Reading Berkshire for DIY garage doors. DIY roller garage doors prices online, manual garage doors or cheap roller shutter garage doors, automatic roller garage doors and electric garage door prices. Automatic electric roller garage door installers throughout London, Abingdon, Reading, Newbury, Thatcham, Maidenhead, Slough, Bracknell, Guildford, Henley, Wokingham, Woodley, Windsor, Oxford, Ascot, Basingstoke areas and across the UK. 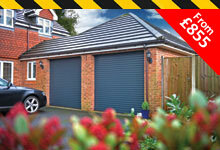 best garage door prices fitted or DIY garage doors. UK wide roller garage doors fitting service available. © Design by Web Genesys.